Travel in Style with the EzyDog Car Restraint! Road trips can be a blast, but not when your dog is climbing all over the passengers! 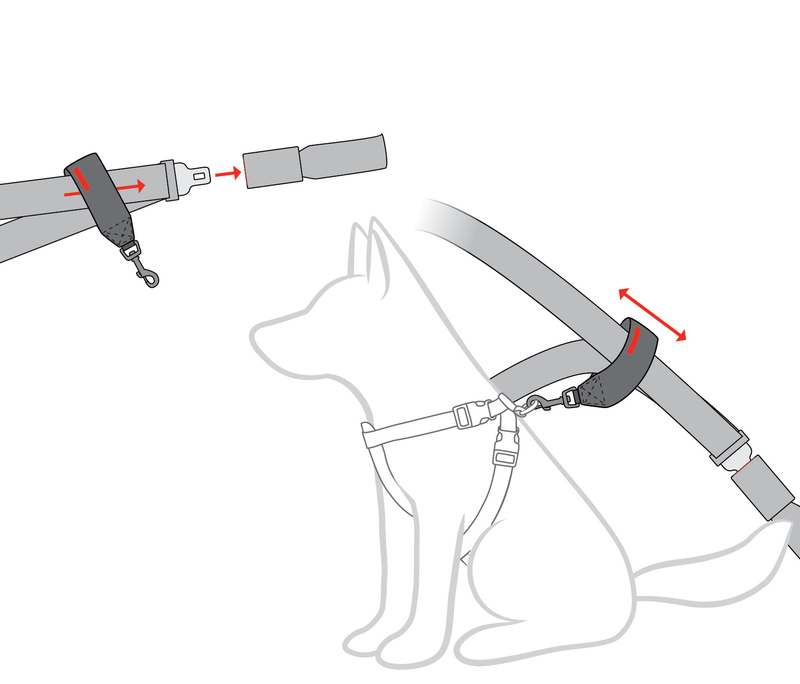 This Seat Belt Restraint attaches to the D-Ring of your dog's harness to keep them restrained, whilst still letting them sit or lay down comfortably. All our harnesses have stainless steel D-Rings, so can all be used in conjunction with the Seat Belt Restraint quickly and comfortably. This product is designed to be used with an EzyDog harness to prevent driver distraction and restrain the dog to one position in the vehicle. In the event of car accident it may not prevent injury to the passengers or your dog. Inspect attachment for wear or abrasion. Do not use if damaged! 3. PULL THE CAR RESTRAINT ALONG THE SEAT BELT DEPENDING ON SITTING HEIGHT OF YOUR DOG. Industry Award Winning Dog Harness. That pretty much says it all for our unique molded chest plate Dog Harness. The EVA chest panel will form to your dogs chest creating a custom fit. The EzyDog Dog Harness rides lower on the dogs chest and our chest plate helps disperse load so it is easier on the owner and easier on the handler. The folks at Animal Wellness Magazine liked it so much they gave it their stamp of approval. "Very simple to use, quick to put on and held our precious cargo just where they eere supposed to be." "Excellent quality car restraint. Does the job, but my dog would have liked it just a little longer. I love your products ! "Linda, Paws & Claws Dog Walking Coffs Harbour"
"I have 3 of these attached to each of the head rests in the back seat of my car. As a dog walker, when I start with a new dog I never know how they will travel when taking them to the beach, I attach their lead to the car restraint and we are good to go. I have a 70 kilo dog that hasn't broken the clip so its obviously made well." "Excellent quality webbing and clip, could've been longer though. Because it held me back so much, I struggled around in my backpack harness and slipped out! Mum was a bit annoyed but got over it, and just cuddled me the whole ride to the beach."